Organize your books with collections. 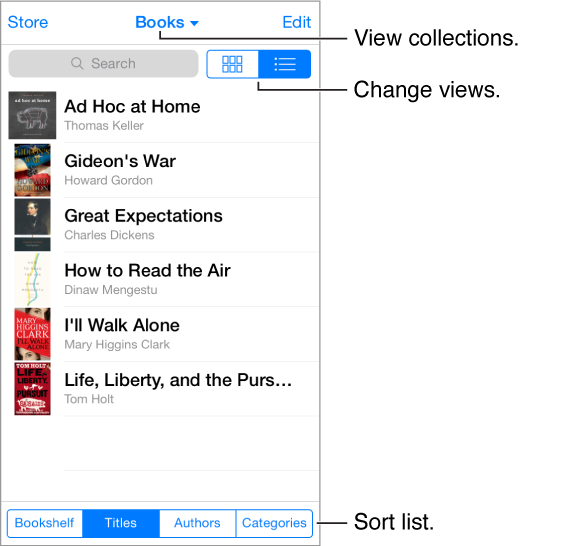 Tap Edit and select some books to move them into a collection. To edit or create collections, tap the name of the current collection (at the top of the screen). Some built-in collections, such as PDFs, can’t be renamed or deleted. View books by title or cover. Pull down on the list of books to reveal the controls, then tap or . Rearrange books. While viewing books by cover, touch and hold a cover then drag it to a new location. While viewing books by title, sort the list using the buttons at the bottom of the screen. Search for a book. Pull down to reveal the Search field at the top of the screen. Searching looks for the title and the author’s name. Hide previously purchased books. To show or hide books you’ve purchased but haven’t downloaded, go to Settings > iBooks > Show All Purchases.